There seems to be a lot of talk — and a lot of confusion — about the best way to make coffee using a French press. For the benefit of my faithful readers (and my morning taste buds) I have done considerable research into this question, and will gladly report my findings, below. Some people are obsessed with the minutiae of coffee making, going so far as to roast their own beans. These people are clearly mad. My research does not apply to them, because they won’t believe anything I say anyway. 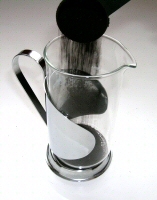 The best grind for a French press is the same as the “drip” grind that is used in drip machines. If you use a finer grind, your coffee will be muddy and it might be difficult to plunge the plunger. Too coarse of a grind will result in weaker coffee with a thinner taste and aroma. Contrary to popular belief, you do not have to grind your own beans. As long as you use a good quality coffee, store it a cool, dry, and dark place (not the fridge), and use it within a week or two of opening the package, it will be virtually indistinguishable from freshly-ground. Those who disagree with me may continue to do so. Those who do not grind their own beans can rest assured that they’re not missing anything. Use cold, fresh water. Ideally, the water should be filtered. Never use water from the hot water tap. Do not boil the water. It should be heated to about 95° C. Boiling water will scald the coffee and make it bitter. Serve the coffee immediately after plunging. Do not let it sit in the French press as you leisurely sip one cup after another — it will quickly become bitter because the brewing continues in the mucky grounds at the bottom of the pot. 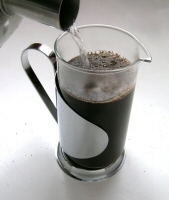 If you make a large pot and intend to consume it over time, transfer it to an insulated carafe that you have “conditioned” by heating with boiling water while the coffee is brewing. 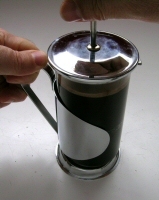 The method below applies to a standard small French press. Bodum claims this is a “three cup” press (three four-ounce servings). That’s ridiculous —- particularly since it actually holds only eleven ounces. For most of us, this is a single serving in the morning, and two servings after dinner (if you drink coffee after dinner — which I generally don’t). (2) Pour in the water. It should not quite be boiling (around 95° C). Do not over-fill! (3) Let it brew for two minutes. After stirring, you should get a rich brown creamy froth. This is called the “bloom.” It is not the same as the crema that forms on top-notch espressos — nor is it entirely different. (6) Plunge. Note: always use a hand to steady the pot when plunging! Ah but we do say “I need to Hoover the living room” (at least us Brits do) or “My nose is running, pass the Kleenex”. North Americans use Band-Aids to fix a booboo. We fasten with Velcro, remind ourselves with Post-Its and cook with Teflon and Cuisinart. We keep things hot with a Thermos and keep things fresh with Saran wrap. Proprietary eponyms are a common part of everyday language, so why not call it a Bodum? Instead of making fun of you (even gentley) I would suggest that you plan to go to Toronto on June 13th and 14th. You can enter into the Canadian Barista Championships. Seriously, thanks for the pointers, maybe now I’ll use the french press I’ve had for over a year without touching it. If I didn’t know better, I’d swear you never kissed a girl before. At least Patrick appreciates my public service announcement! Boo hoo hoo! what drives me absolutely frikking nuts is when a waiter asks if i want a “long” espresso. an espresso is an espresso. if i want an allongé i’ll ask for it. and if i have to teach you this you shouldn’t be serving coffee. It’s too bad that you live with someone who doesn’t drink coffee and therefore cannot appreciate your science. But hey, that means you get to kiss a girl who never has coffee breath. Fiveblue, in your case (two separate kinds of coffee machine), there might be a case for grinding your own beans. On the other hand, would you not use two different KINDS of beans? As in, espresso roast for the espresso machine and other roasts for the French press? I’m not saying that grinding your own beans is wrong. I’m saying its over-rated. Um, have to disagree with Martine. Living with someone who doesn’t drink coffee means never having to wait. And never having to worry that someone else will finish whatever beans are left. – people, listen to what the man says about not using coffee that’s too finely ground. There is a ridiculously fine line between “might be difficult to plunge the plunger” and “hot jets of near-boiling liquid spraying all over yourself and the kitchen.” I can’t say for sure, but the line between that and “shards of hot glass flying at you and everyone nearby” is probably not much farther away. Use coarse-enough coffee. Thanks for the tips, Marty. Regarding the spoon, a wooden one would work nicely, but I don’t bother — for two reasons: (a) the grounds mostly all float during the first phase of brewing, so they are all in a big clump at the top of the pot, and (b) I’m lazy and in a hurry in the morning, so I don’t want to dirty another utensil. However when I use my larger French press, I generally do use a bigger spoon for stirring. You see… I used to think that preparing a nice cup of coffee (Brazilian coffee, I must add) was the easiest of all my chores. But now your post made me question the whole definition of “a nice cup of coffee”… oh well, sometimes living in ignorance doesn’t seem like such a bad idea. But Q, there are many ways to make coffee, and most of them are good! The key is to know HOW to make each kind of coffee! Brazilian coffee: add Kaluha (sp? ), strip down to your skimpiest clothes and go out dancing in the streets. I never like French Press coffee. probably because it was badly prepared, and with bad coffee I suppose. But, what the point for French Press? Is that any better than percolated coffee? I know it is supposed to be stronger. We have a cheap italian expresso thing (works on the stove). Dose accordingly coeffe/water to have a short or an allongé expresso, and that it. Way less cafeine than percolated and French Press (Bodum is shorter to write!). So you can enjoy a great expresso after supper to help digestion and it does not interfere with sleep! What more could you ask ?!? Thank you SO much for specifying that you shouldn’t keep your ground coffee in the fridge. I shudder every time I see someone doing it, but it’s amazing how few people know that you’re not supposed to do that. I worked in a coffee shop many years ago and although I’ve forgotten 99% of the coffee trivia that I learned then, that’s one tidbit I’ve retained. Sherry, I used to do that myself (keep coffee in the fridge and even the freezer) but no longer. I was under the belief that the cool environment would help preserve it. On the other hand, if you have a large quantity of un-opened coffee, you could keep it in the fridge until you open the package, then leave it out. The fridge (maybe even the freezer) MIGHT preserve coffee over time. However, as I said, once you open it, keep it at room temperature — if you keep it in the fridge, the constant “freeze/thaw” effect of taking it out and putting it back can really tire it out, and quickly. Q, thanks for the link! That recipe looks like the same one that is used for Turkish coffee, although Turkish coffee doesn’t even bother with the filter — you just let the grounds sink to the bottom of the cup! Blork, thanks for the tips. We have, chez nous, a 2kg pack of lavazza beans bought in the interests of economies of scale and late nights. You think I should grind a portion, leave it out and put the rest of the beans back in the freezer? Does it matter for the beans? Interestingly, it was the boycott of French wines during the nuke testing that opened my eyes to Australian (and other) wines! It’s a tough call on the beans. What you want to avoid is moving the beans into and out of the freezer repeatedly. Divide the 2 Kg bag into four 500 gram portions. Put each in a zip-lock bag (squeeze all of the air out before sealing them). Put three away in a cool, dry, and dark place (e.g., back of the pantry). With the remaining bag, use as you normally would. For me, that would probably mean grinding a couple of days worth at a time. In the meantime, always squeeze the air out of the bag and store in a cool, dry, and dark place. When the first bag is empty, start on the next one, etc. I would avoid the freezer altogether — especially for whole beans. All that surface area is just begging for condensation and freezer burn! 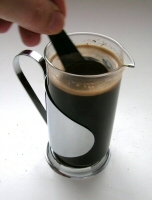 We don’t have a French press at the moment and, boo hoo, our beloved Philips-Alessi coffeemaker is busted…. I have a lovely Charlescraft espresso/cappucino maker from the 1970s — all metal construction underneath, brown plastic outside, just a single big dial to turn, real bachelor pad chic. But real espresso is too strong for us most days, so now we grind Santropol Espresso Noir beans (not too finely) and use a cone filter to drip-brew them into…a big glass Bodum teapot. How ironic. Since I’m asked to read back this with your post, I will add my two cents here. 2- Put some boiling (Yes, boiling) water slowly in the pot. Put the filter in it, let it sit 10 seconds, drain. That makes certain the pot is hot, makes certain the water is not boiling afterwards when coffee is involved. Keeps coffee hotter longer. 3- Put coffee in pot. 4- Put some water in it, maybe 1 quarter of the pot. Shake the coffee. Wait. The coffee with start to expand and becoming grayish with the air and water. 5- Add water to the near-top. Keep at least 1in between the top and the coffee, or else it might decide to go elsewhere. 6- put the lid on, drop the filter in the water and back up near the coffee, do not let it touch it after that small press. Less froth that way, but a richer taste due to the coffee being in total contact with water, and not only in contact with air.